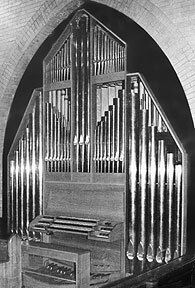 There are three divisions of the organ (Great, Swell, and Pedal) with a total of 1566 pipes comprising 22 Stops and 29 Ranks. The Great Organ, the main division, is in the upper center of the case and is played from the lowest keyboard. The pipes of its most important stop, the 8 foot Principal, form the copper facade. The Swell Organ, located Behind the Great, is enclosed behind shutters which can be controlled by the organist to produce a range of dynamics. It is played from the middle keyboard. The Pedal Organ is to the left side of the chamber. The pipes in it include a 16' Bourdon and a 16' Fagot. The highest keyboard controls the Chamade Trumpet (in the rear of the church) and the Chimes in the back of the organ chamber. The organ uses a suspended mechanical key action and mechanical stop action. The direct connection between keys and pallets, provided by wooden trackers, gives the organist considerable control over the speech of the pipes. The wood in the console and case is white oak. Natural keys are covered with ebony and the sharp keys are covered with bone. The stop knobs are rosewood.